Things We Love and USE // 05 – Live, Love, Simple. That said, this is my series called, Things We Love (and USE). The emphasis being that these are things that we both love and actually use on a regular basis. This post is not sponsored in any way. 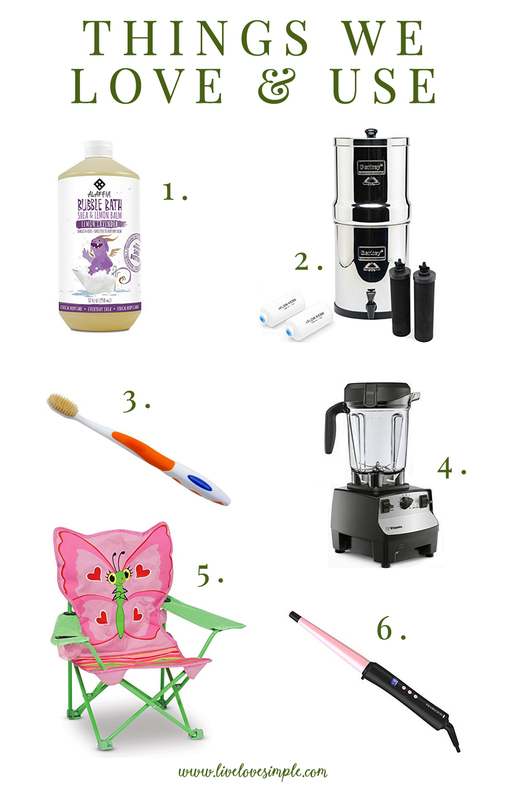 Here are a few things that are currently making our lives a little bit easier, comfier, and more beautiful. 1. EveryDay Shea Bubble Bath Lemon Lavender — I had actually planned to dedicate an entire post to this bubble bath, but haven’t gotten around to it yet. Suffice to say that it is amazing. I’ve written before about our favorite natural bubble baths, but this one has moved to the top of the list by far. I don’t think I’ll ever find a better one! This stuff creates so many bubbles. I literally cannot use more than a small cap-full otherwise an insane amount of bubbles will overflow out of the tub. It’s super effective in cleaning my kids skin & hair, but still very gentle on their sensitive skin. I randomly came across this stuff in our local health food store and I am so grateful that I did. Aside from being an amazing product, the company is truly dedicated to sustainability and ethics. 2. Berkey Water Filter — I have been wanting to switch from drinking bottled water to drinking filtered tap water for years! However, I was never in a good position to install one of the expensive entire-home filters. After lots of research and recommendations from friends, I finally purchased the Berkey. It works really well. I am super sensitive about drinking water taste and smell and this eliminates it all. If you are concerned about the crap that gets put into our drinking water — which frankly everyone should be — then this is an excellent option. It removes arsenic, uranium, aluminum, and fluoride down to almost nothing, whereas these things are very present in unfiltered municipal water. You can do the research for yourself but I am so grateful that I’ve made this decision for myself and especially for my children. 3. Dr. Plotka’s Mouthwatchers Tooth Brush — I’ve been using this toothbrush for a few months now. I really love it. It has special bristle technology that eliminates 99.9% of bacteria that builds up on bristles in 6 hours. The bristles are also specially made to be “flossing bristles.” The long, soft tips of the outer bristles slip between the teeth to reach areas missed by other toothbrushes. The harder inner bristles ensure complete cleaning of the outer surfaces and massage the gums. Good stuff for a clean mouth. 4. VitaMix Blender — After lusting after a VitaMix for years, I finally took the plunge six months ago. It was the best decision that I ever made for my kitchen and plant-based lifestyle! I have used cheap food processors in the past and I was always disappointed, especially when after less than a year of use I saw my cheap processor starting to flake off pieces of plastic into our food! Ugh. The VitaMix is amazing. It is incredibly powerful and I use it to make everything from smoothies to sauces to dips and everything in between. I truly use it at least daily or every other day, sometimes multiple times in a day. It is a bit expensive. I purchased a refurbished model to save on the cost and it’s been an excellent investment. 6. Remington Pro Curling Iron — Believe it or not, I’ve never owned a curling iron. I tried using my mom’s when I was younger and it was always a fiasco. Recently a bunch of curling wand videos had been popping up in my Facebook and Instagram feeds. It looked so simple that I decided to give it another shot. Also, who doesn’t love beautiful curls and waves. More than anything, though, I wanted to be able to start curling Marina’s hair too. After a bit of research I decided on this Remington Pro model and I absolutely love it. I am still learning the best way to curl my hair, but it has been so easy and fun to curl Marina’s hair. Aside from being beautiful and easy-to-use, I also love that this model has several different heat settings. I can use a lower setting for Marina’s fine hair and a higher setting for my thick, coarse hair.